Unfortunately there are not many documents available in electronic form. The reason is that the Series 32000 family was born long before the WWW was invented. But anyway here is what I have. Any other documents are welcome! Eleven datasheets are available. The first two are very helpful in understanding the latest implementation of the architecture. The datasheet about the NS32C032 CPU is astonishing because it was published in November 1995, ten years after the CPU was released. In 1995 the NS32C032 was completly outdated. Why this was done remains mysterious. 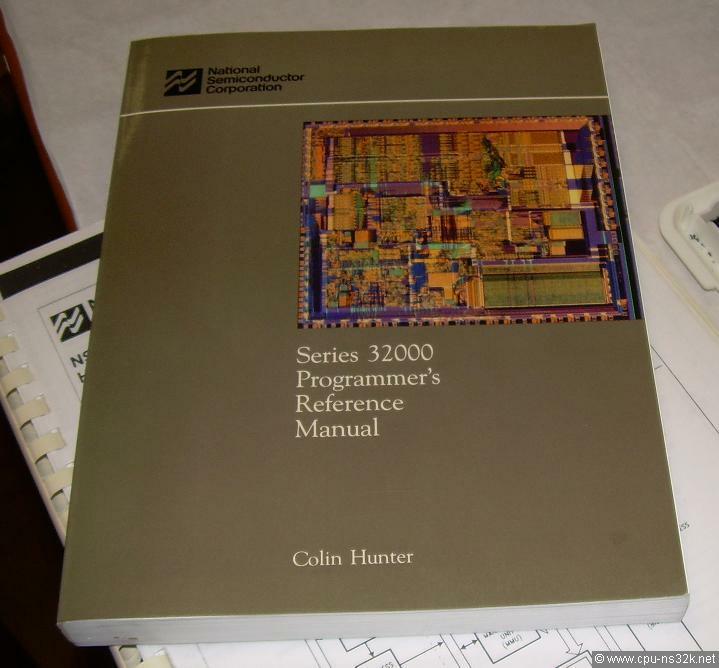 The most important document if you want to program a Series 32000 processor! Based on the original NS32000 Instruction Set Manual from National Semiconductor this version is updated to the architecture of the NS32532 CPU and NS32381 FPU. The following document describes the execution times of all opcodes of the NS32016 CPU and NS32081 FPU. It is interesting to see how many clock cycles were needed for certain operations. Every vendor of semiconductor devices offers Application Notes for his products. The only purpose is to support the customer. Therefore the Application Notes covers a wide range of topics from basic hardware functional descriptions to sophisticated software examples. An Application Brief is a short Application Note. For example the content of AB-40 fits on one page. All but one Series 32000 devices had bugs. The lone exception was the NS32382 MMU. Bugs are no surprise since all chips are complex designs. But with all the problems described in the bug sheets one may wonder that the systems build with this chips were still functional. My own experience with the NS32016 and the NS32532 CPUs is positive. I never hit a bug. But one of my NS32381 FPUs failed. I thought that it was broken but later I learned that revision C/10 had a serious bug. I replaced the FPU with a revision D/10 chip and everything was fine. There is an interesting note about the NS32332 CPU revisions B and C: the interior of the NS32332 package contains Beryllium Oxide! This substance may pose a health hazard when inhaled. It was recommended that the NS32332 be returned to National Semiconductor for disposal. In the newer bug sheets this note is no longer found. The following document is obviously not downloadable. But it is a nice book and it contains some general thoughts about designing an architecture and describes some goals of the Series 32000 designer. You can still buy it on e-bay. I got my copy in 2012. The content is based on the second generation of the Series 32000 chips. The chip on the cover is the NS32332 CPU. If you can get it for some Euros you make no mistake. Fig. 1. To my knowledge one of two books about the Series 32000.